JR Motorsports gains valuable points. 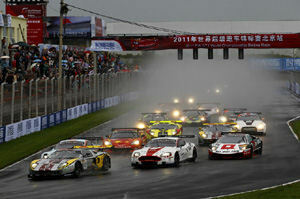 Round 9 of the 2011 FIA GT1 World Championship was held at the Goldenport Circuit in Beijing, China on September 11th, 2011. 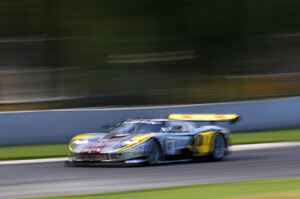 A change from the normal GT1 weekend race format for the penultimate round of the Championship saw both the Qualifying race and Championship race occurring on the same day, just hours apart. Both races were won by the Young Driver AMR team, with the No.7 car of Tomas Enge and Alex Müller and the No.8 car of Darren Turner and Stefan Mücke sharing the victory and second position in alternating order. Third position in the Qualifying race went to the No.4 Hexis Aston Martin of Andrea Piccini and Christian Hohenadel and in the Championship race to Lucas Luhr and Michael Krumm in the No.23 JRM Nissan GT-R. The No.23 Nissan GT-R also finished fourth in the Qualifying race, after a difficult qualifying that saw them drop out in the first session. Team-mates Richard Westbrook and Peter Dumbreck in the No.22 JRM Nissan GT-R finished seventh in both races. The Sumo Power GT-R's followed in ninth (No.20) and eleventh (No.21) in the Qualifying race and sixth (No.20) and eighth (No.21) in the Championship Race. Aston Martin romped to a podium clean sweep in a rain-soaked Qualifying race in Beijing. 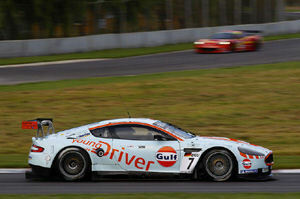 The No.7 Young Driver Aston Martin DB9 of Tomas Enge and Alex Müller took the race victory at Goldenport Circuit from their stablemates Darren Turner and Stefan Mücke in the No.8 DB9. Third was the No.4 Hexis AMR of Andrea Piccini and Christian Hohenadel, which had started from 10th position. Nissan needed to get off to a flying start in the morning's Qualifying race after a challenging Friday Qualifying session saw the GT-R's lining up on the race grid much further back than has become customary this year: eighth (No.21), ninth (No.22), 14th (No.23) and 18th (No.20). Thankfully, the Nissan GT-R's got off to a good race on a very wet, rain-soaked circuit, as with competitors spinning out all around them due to the adverse weather conditions, the Nissans were able to expertly motor through the field. The pole-sitter, the No.41 Marc VDS Ford GT of Bertrand Baguette and Maxime Martin was first to visit the famed Goldenport gravel at T7 after just five laps. The safety car, a common sight over the race weekend, was deployed while the car was towed out and Baguette brought it back to the pits and into retirement. The race finished under the safety car after local boy Ho-Pin Tung spun off at T8 and beached the No.11 Exim Bank Team China Corvette with eight minutes remaining. The car was towed from the scene as the clock ticked down to the chequered flag. Pick of the Nissan GT-R bunch was the No.23 JRM, which made up ten places from its starting position to finish the race in fourth due to strong drives from Krumm and Luhr and a great tire change from the pit crew, whilst the No.38 All-Inkl.com Münnich Motorsport Lamborghini Murcielago of Marc Basseng and Markus Winkelhock, which had been running strongly in second place behind the No.7 Aston Martin, dropped down to 12th position and out of the points due to a drive-through penalty for a pit lane infringement. 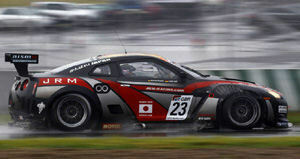 The No.20 Sumo Power GT also made up an impressive eight places during the race to finish in tenth position. Rounding things off for Nissan were the No.22 JRM in seventh, and the No.21 Sumo Power GT in 11th.